With dignity and respect for all, senior Lauren Parnell seeks to understand and improve communities from West Evanston to East Africa. Lauren Parnell knows the true cost of fair trade crafts. She paid for her basket-weaving endeavor with an achy back and sore hands. 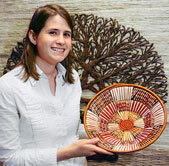 While in training for her internship with Uganda Crafts in Kampala, Parnell transformed banana stem and dyed raffia into a stout and sturdy basket, though she says her craftsmanship came up a little short. Backed by an Undergraduate Research Grant, the senior social policy major spent last summer doing hands-on research on the fair trade industry in Africa. She met with fair trade artisans and coffee growers in Tanzania and Uganda as part of a United Students for Fair Trade delegation (led by USFT national coordinator Joe Curnow [SESP05]) and spent a month with Uganda Crafts. Parnell worked with Uganda Crafts’ five staff members, negotiating between artisans and U.S. craft buyers, checking quality on export items and contributing to monthly sales reports and marketing strategies. Besides her basket, she also designed shoes and a building — she and a colleague drew up plans for a papermaking factory, including a gift shop and worker housing, that is currently under construction near the equator. She left Africa with good material for her senior honors thesis on fair trade — and much more. “The thing I learned is that people are people wherever you go,” Parnell says. She is also planning her sixth service trip to the Catholic mission at San Lucas Tolimán in the Guatemalan highlands in March. Parnell, who went on her first trip to Guatemala as a 16-year-old high school student, picked up her service ethic from her parents. She shared her home in the St. Paul suburb of Mahtomedi, Minn., with several foster children, including twins (a boy and a girl) from Mexico and a girl from Korea who later became her adopted siblings. “Growing up in that situation made me realize how important it is to be an informed member of the community who’s willing to lend someone a hand if they’re stuck,” Parnell says. Parnell’s outreach efforts earned her a 2006 Student Laureate Award in November from the Lincoln Academy of Illinois. In April Parnell was named one of five Northwestern volunteers of the year for her work with Chicago’s homeless and immigrant populations. Parnell is a deserving recipient, says Susan Guderley, the city of Evanston’s neighborhood planner. In 2004–05 Parnell and two classmates worked with Guderley on a directory of West Evanston neighborhood organizations for the team’s certificate in service learning. For her part, Parnell admits that her service is always rooted in relationships. Sean Hargadon is senior editor of Northwestern magazine.